One look at Airbnb‘s visionary business model and you’d assume the idea was sparked somewhere in the halls of Harvard or within the mighty walls of Wharton’s Business School. But it all began far from any type of business school; on the sofa of a San Francisco flat rented by two struggling, but innovative young men; Joe Gebbia and Brian Chesky. After a popular design conference left San Francisco’s hotels completely booked, Joe and Brian, who were desperate to pay their rent had an idea to share their apartment for a small price. A quick website and a few small ads were enough to convince three people – a 30-year-old Indian man, a professional woman from Boston and a family man from Utah – to pay a quick $80 each to spend the night on some makeshift beds with a free home cooked breakfast. As the two friends waved sat on the edge of their sofa, waving goodbye to their temporary guests, they both looked each other in the eye and knew. As soon as the final guest left, the idea was born. There was a much bigger, much greater movement that began in their small apartment. That morning, Airbnb was born. The concept of creating a site based on renting a space – without any overhead, property management or staff – was the perfect business model that would spark the future of sharing. Targeting conferences, events and festivals across America, they would get local people to list their rooms and match them with travelers to book those rooms for a fee. It didn’t take long for their concept to catch fire with social sharing as the gasoline to ignite an explosion of travelers seeking alternative lodging opportunities. Airbedandbreakfast.com was launched on the 11th of August, 2008. At the very beginning, Joe and Brian offered their redesigned living room with 3 air beds to people who couldn’t, or didn’t want to book a hotel. They also prepared a breakfast in the morning for their guests, this is why the business was named AirBed & Breakfast. Soon the site started expanding and increased its database of available properties with listings from other people with spare rooms and places. The young entrepreneurs now knew that their idea had a big potential, but they needed money to grow it. To raise cash to finance their startup, they created a special cereal breakfast with the presidential candidates in 2008 (Obama and McCain) and managed to collect $30 000 from selling it. They soon started including hotel rooms listings on the site and managed to attract the attention of the Y-Combinator seed accelerator. The fund agreed to invest $20 000 which Joe and Brian used to go to New York and spread the word for the site there. At the beginning of 2009, they decided to choose a shorter domain name and this is how actually Airbnb.com became the main name of the site and the company. Since then, the company has experienced a tremendous growth in its business. Today Airbnb operates in more than 190 countries from around the globe and no matter you go, you can use their services to book a place in a few clicks, buy just using your smartphone. 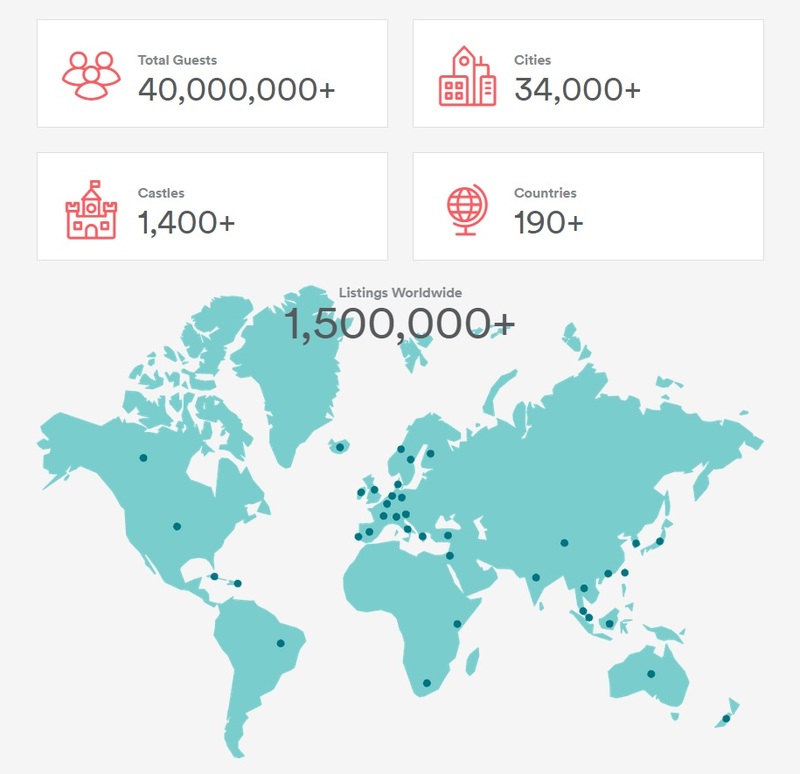 In 2015, Airbnb is having its busiest year ever, with more than 10 million nights books in 34,000 cities across the world. Liked the article? Now you can try some of our cool social buttons on the site;).